I was looking for an easy to wear but elaborate costume and thought it would be fun to make it active. So I thought of a puppet. It was a lot of fun to make sculpting the head out of flower foam. This is the foam they use in the bottom of flower arrangements. and had a texture snake skin square about two feet. I made 12 of these to make the whole snake. 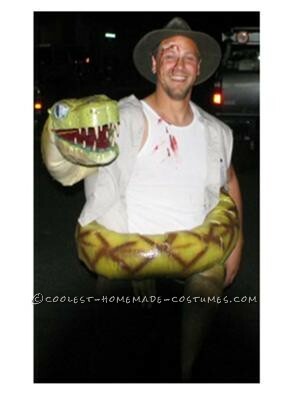 For myself I just found some clothes that look like jungle wear, a long sleave shirt and put a fake hand in the one sleeve and had it pined under the snake so it looked like the snake was crushing me and had my hand pinned. I just used liquid latex and painted patches on my skin then pulled the middle of them, filled them with fake blood to look like nasty wounds from the fight. p.s love this site hope to get more of my stuff on here and I take ideas from people and will also love to help people with ideas and designs. I know a million easy cheap materials people can use to do tons of things.